This time maybe luck was a little bit on my side. After 3 times in a row finishing on 2nd place based on climbing in qualifications or semifinals, it turned out that only i finished the route ... Jain Kim also almost did it too, but fell from the top, although she almost held it, but didn't resist the swing. 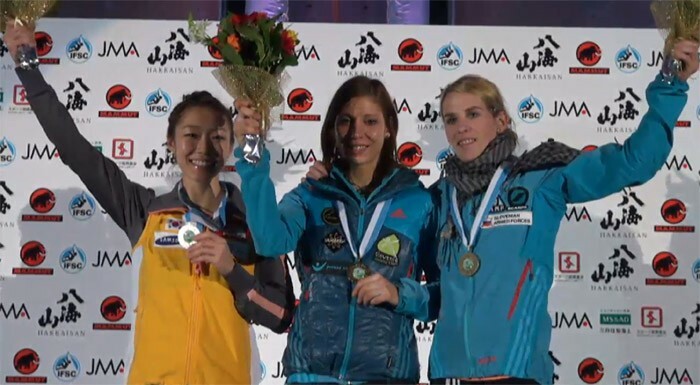 Maja Vidmar also completed this nice podium with a great climb! So, now we're going home and there will be a little break till last WC stage in my home country - Kranj, Slovenia, and i am already looking forward for this nice and classic event! :) Till than, i will have some nice and precious time to rest and prepare myself for this last event. For WC 2012 overall (lead) everything is still open. 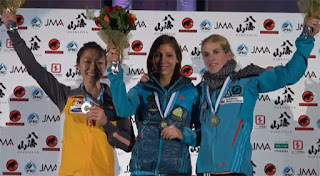 So it will be judged in Kranj, who will take the 'crown' of the lead WC 2012. With men it will be 'battle' between Ramon and Annma and with girls me and Jain will compare our strength!